Manchester City will attempt to go three points clear on top of the league as they host Chelsea this afternoon for an exciting clash at the Etihad. Pep Guardiola’s side has won an important match against Everton on Wednesday which saw them surpass Liverpool at the top on goal difference. However, things might change over the weekend as Liverpool face Bournemouth at home while City will meet Sarri’s side who come into the match confident they can do harm to their opponents. With Laporte having played as at left-back against Everton on Wednesday, Guardiola has two options, either start with the French centre-back once more, or give Danilo a chance to start. The first option seems to be the most likely. Otamendi is the only one sure of his place from the start with Laporte and Stones both fighting for a starting lineup place. Walker will start on the right. Kevin De Bruyne could return from the start in midfield alongside Fernandinho and David Silva. In attack, Raheem Sterling could be awarded a starting place spot at the expense of Bernardo Silva while Aguero and Sane are both set to retain their places. Maurizio Sarri has no injury within the team and will face City with a fully fit squad, therefore many options to choose from. Long term injured Marco van Ginkel will be the only absentee for the match. The Italian manager could make only one change in defence with respect to the last match against Huddersfield with Rudiger replacing Christensen at right-centre back position. Spanish duo Azpilicueta and Marcos Alonso could start at full back positions while David Luiz should retain his place following some strong performances lately. In midfield, Kante and Jorginho are both certain of their place but Kovacic could start instead of Barkley who was started against Huddersfield. 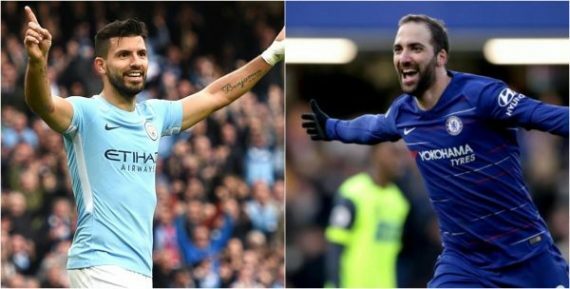 New man Gonzalo Higuain, who got his first brace for Chelsea last Saturday, is set to start at striker position with Willian and superstar Eden Hazard to his sides. Throughout history, the two teams have met for a total of 155 times across all competitions with City winning 53 times while Chelsea won on 64 occasions. The two teams drew against each other for 38 times in total. 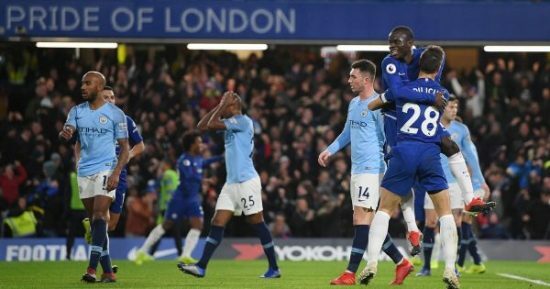 Since the start of the Premier League back in 1992, the two teams have met 43 times and still, Chelsea lead the race (25) with most wins against City (11). The remaining seven matches ended in a draw. Guardiola, while in charge of City, has lost on three occasions against the Blues, making them his bogey team for the Spanish manager. The last one came in December when Sarri’s side won 2-0 at home with goals from Kante and David Luiz. Manchester City will be hoping for another positive result as they come from back-to-back wins against Arsenal and Everton. The Citizens have lost only once against Newcastle in their last five matches and won all the other four across all competitions. Manchester City last five matches. The Blues, on the other hand, lost two of their last five fixtures with one of them being a heavy 4-0 loss to mid-table side Bournemouth. On a positive note, they beat city rivals Tottenham in the League Cup to book themselves a place in the final. Man City have scored at least 2 goals in their last 14 home league matches. They are backed at 1.28 to score two or more today. Man City have won 13 of their last 14 fixtures at the Etihad while Chelsea won their last fixture against Pep Guardiola’s side. Both teams to score two goals or more.